Harbor seals check out Formula 18 catamarans starting line. There were 109 boats in 11 classes. 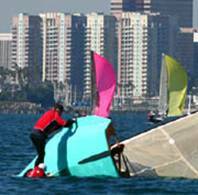 LONG BEACH, Calif.---Not to be an ungracious host, but small sailboats are Alamitos Bay Yacht Club's business, which is why its sailors won most of the prizes while running those classes in the Southern California Yachting Association's 79th Midwinter Regatta Saturday and Sunday. Over the years the club has produced world champions and Olympic medalists like USC and Notre Dame turn out Heisman Trophy winners. 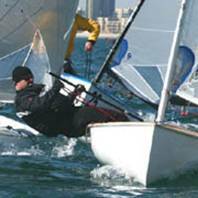 This time the list included Pease Glaser, a silver medalist at Sydney in 2000, and Barney Flam, 83, a local icon of sailing success who must rent a warehouse to store a lifetime of trophies these days. He picked up another one by winning the 13-boat Cal 20 fleet with his similarly accomplished son Steve as crew. Glaser won a strong A Class catamaran class by winning five of seven races to beat out her husband Jay Glaser---also an Olympic silver medalist---by four points. "It was our [18th] anniversary," said Pease (pronounced pee-zee). "He let me win." Not likely, unless most of the top A-Cat sailors from San Diego to Santa Cruz also were in on the fix. On the other hand, Paul Galvez was the only ABYC member among 16 competitors in a strong International 14 class---and won all seven races. Altogether there were 109 boats in 11 classes, towing their assortment of little high-performance craft in from San Diego to Seattle. Farthest traveled was Laser sailor Thomas Kloumann from Norway. The weather was sunny, if cool in the lower 60s, and winds were 6 to 12 knots, peaking late Sunday afternoon as competition wound up. Non-ABYC winners were Finn veteran Andrew Kern (actually a Long Beach resident who represents the Des Plaines YC in Illinois), Brandon Wallace and crew Damon Lacasella of San Diego's Mission Bay YC in Formula 18 catamarans, and Lido 14 veterans Kurt and Anne Wiese of Newport Harbor YC. Galvez, with Guillo de la Barra as crew, now owns the boat that ABYC's Howie Hamlin sailed to win the I-14 Worlds at Long Beach in 2006, and he has international ambitions of his own with plans to race in the European and world championships in Europe this year. "I've had the pleasure of sailing with some pretty good sailors this past year and I think I'm pretty much there," Galvez said. "We're pretty comfortable in all conditions. We had a lot of good people out this weekend . . . probably the best pool of talent since the Worlds here. The only problem is that when we practice we sail against our shadow." The Wieses beat out the four-time Lido 14 class champion Stu Robertson by five points---the difference coming in the last race, which the Wieses won as Robertson finished sixth. "We still haven't won the class championship," Kurt Wiese said. "We'll be trying again [at Oregon's Fern Ridge Lake] this summer." Barney Flam was as modest as always. "It's easier to win when Steve is doing everything else and all I have to do is steer," he said. Pease said she and Jay were married on Presidents Day in 1990 because nobody had scheduled a regatta that weekend. "Now we race on our anniversary," she said. 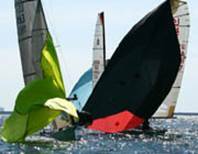 A CLASS CAT (13 boats)---Pease Glaser, Alamitos Bay YC, 1-(6)-1-4-1-1-1, 9 points. 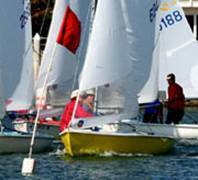 5-0-5 (6)---Kevin Taugher/Jim Carey, ABYC, 2-1-1-1-1-(DNF), 9. CAL 20 (13)---Barney and Steve Flam, ABYC, (9)-1-4-2-2-2-1, 12. FINN (13)---Andrew Kern, Des Plaines YC, 2-2-(4)-2-1-2-1, 10. FORMULA 18 (7)---Brandon Wallace/Damon Lacasella, Mission Bay YC, 2-1-1-1-(3)-1-1, 7. LASER (6)---Jay Golison, ABYC, 1-1-2-1-1-1-(DNC), 7.
INTERNATIONAL 14 (12)---Paul Galvez/Guillo de la Barra, ABYC, (1)-1-1-1-1-1-1, 6. LIDO 14-A (16)---Kurt and Anne Wiese, Newport Harbor YC, 1-1-6-(7)-2-1-1, 12. 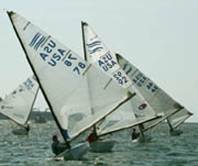 LIDO 14-B (9)---Andrew Vaught/Kate Bishop, ABYC, 3-(8)-1-1-2-2-1, 10.